The discovery of a natural source of electricity by Benjamin Franklin in 1742 was followed by a century of investigation as to its nature and uses. The names of several early experimenters were given the properties and measurements they discovered -- the Italians, Luigi Galvani and Count Alessando Volta; Frenchman Andre Marie Ampere; German Georg Simon Ohm; and American Joseph Henry. Those within the elevator industry often unconsciously use the names of these pioneers when speaking of electrical applications and measurements galvanic, volt, ampere, ohm and henry. 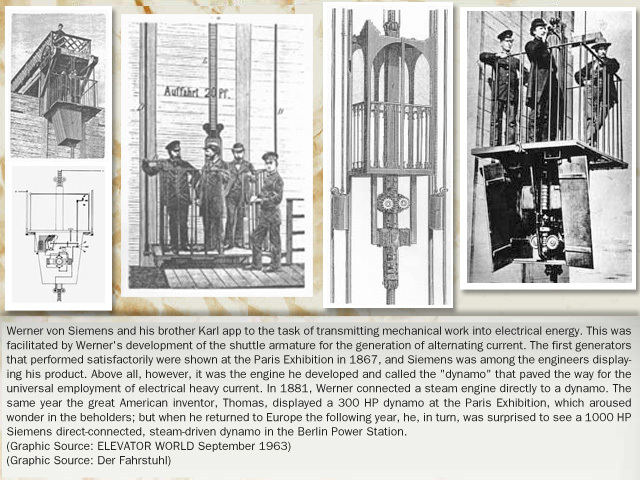 Thereafter, the thrust of scientists and engineers was to discover practical ways to generate, transmit and utilize what obviously could become a servant more powerful than steam, gas or hydraulics. 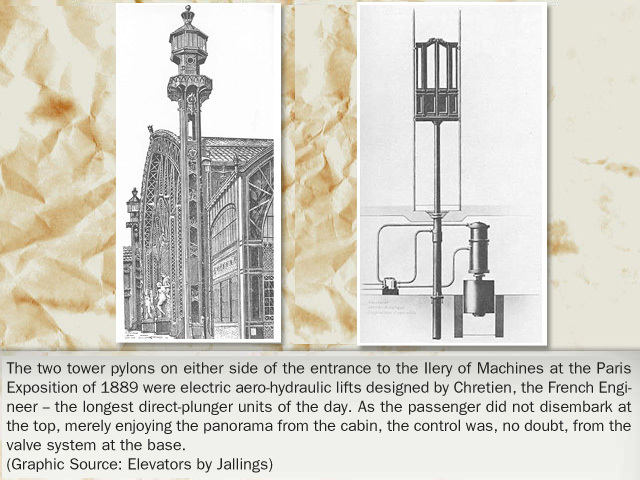 Steam and gas power had been of little use to the elevator industry until a way was found to transfer its force into rotary motion and this goal next to the provision of illumination was primary to many inventors, not least of all the English physicists, Michael Faraday and William Sturgeon. The story of the race to develop practical electric rotating equipment will be explained graphically within this Gallery in the near future. For now, we will jump ahead to the development of the first electric elevator and merely comment that electricity provided the means of delicately controlling the ever-swifter movement of passengers and goods, along with a redundancy of safety devices, in addition to the motors that allowed travel ever further and faster. Electricity's effect upon lighting, air-conditioning and safe, swift, well-controlled elevators made the skyscraper possible. However, as will be seen in this Wing, the road had a number of rocky spots and a few detours before the ultimate goal was reached.